Inclusive Technology, the market leading supplier of assistive technology for special education has partnered with Avantis Education to bring together the first virtual reality solution for special schools around the world. Special and early education is all about learning through experiences. Rather than sitting in front of a screen or printed resource, Inclusive ClassVR immerses students in spectacular 360º environments that enhance and complement their real-world exploration and play. The package includes four headsets housed in a bespoke storage and charging case, together with an easy to use Teacher Portal. With access to hundreds of curriculum aligned, virtual and augmented reality resources, Inclusive ClassVR has been specifically designed to educate, motivate and raise engagement for students of all ages and abilities. It's affordable, too. The 'standalone' headsets deliver fully immersive virtual and augmented experiences. They are lightweight and comfortable; students can even wear eyeglasses! With an HD screen, 8MP front-facing camera, integrated Wi-Fi and a battery that will last the school day, Inclusive ClassVR is ready to go straight out of the box. The Inclusive ClassVR Teacher Portal makes it easy to plan lessons in just a few simple steps and then deliver them to every student simultaneously. Monitor what they are seeing and keep everyone on track, while guiding them through the experience, highlighting points of interest and promoting collaboration and peer discussion along the way. Allow your students to learn, explore and experience virtual reality at their own level and pace. 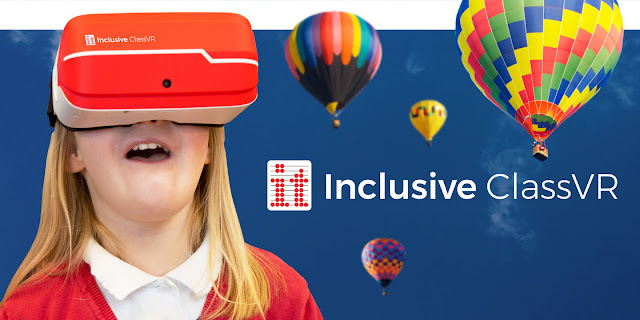 The Inclusive ClassVR can be ordered on www.inclusive.co.uk. Inclusive ClassVR can also be purchased through Inclusive Technology business development managers and resellers worldwide.